Want a greener thumb? Take a tablet. While a delicate digital device will never replace more conventional tools in the garden or on site, you’re far more likely to have your smartphone in your pocket than a spirit level. 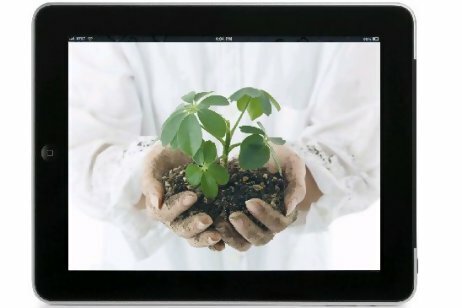 Nick Leech looks at the best new garden-related apps for phones and tablets. Whenever I go to work, there are certain things that, as a landscape designer, I always carry in my bag. These include my digital camera, a small external hard drive, a 30-metre long measuring tape, pens and a two-year-old diary so full of collected wisdom that it’s bound shut with a rubber band. Part notebook, part sketchbook, part almanac, the diary is full of the things I’m too stupid or lazy to remember: the reading lists, tables, charts and formulae that remind me how to calculate everything from gradients and fertiliser rates to the correct arrangement of car parking spaces, staircases and disabled access ramps. For many years now these items have been the indispensable tools of my trade, but I was recently given a tablet-style computer that uses apps, and these have encouraged me to reconsider not only the equipment I need when I visit a new site, but also the kind of work that’s then possible when I get there. One of the first things that needs to be done with any new garden is a site survey in which boundaries, trees, paths and other existing features are measured and recorded as part of the preparation of a new plan. Juggling a notepad with a pen and a tape measure is always a struggle, but three apps in particular make this job significantly easier. The My Measures and Dimensions app can’t take my site measurements for me, but it does provide a clear and information-rich way of placing them directly onto a photograph so that I have the measurements and a good record of the site. My Measures also allows me to place dimension lines accurately, to calculate areas, angles, and volumes, and to do this in a way that avoids the messy handwriting and scribbling that can often make survey notes unintelligible once you are back in the office. For notes and sketches that are more detailed, discard your pen and paper in favour of Penultimate, or any one of the many handwriting apps that are now available. Penultimate provides unlimited pages in unlimited notebooks and a choice of pen sizes, ink colours, as well as an eraser to deal with any mistakes. Although the app is quite basic, its charm comes from its beautifully designed, intuitive tutorial and the ability to save your doodles as a PDF that can be sent out directly from the app. The results can appear quite rudimentary at first, especially until you get used to drawing and writing with your fingers, but a stylus can be purchased should you decide that your digits aren’t up to the job. Estimating height and distance is something that I’ve always found difficult, particularly when I’ve had to survey trees and buildings. FindHoD is an app that removes all the guesswork from your calculations by using trigonometry to calculate the height or distance of any target. You simply have to enter your height, and then hold your device 30cm from your head and aim it using its camera function. The app then does all of the necessary calculations and shows you the measurements. This kind of accuracy is also essential when it comes to building your garden. One of the key things you’ll need to establish are the levels and falls that will allow water to drain properly as and when those winter rains arrive. While I’m not suggesting that an expensive and delicate digital device will ever replace tools on a construction site, you’re far more likely to have your smartphone in your pocket than an inclinometer, as I found recently when remonstrating with a wayward contractor. When, suspiciously, no spirit level could be found during a recent site inspection, it took a measure from my Clinometer HD bubble level and slope finder app to prove that water would actually drain toward the building and not away from it unless the paving in question was taken up and re-laid. The app didn’t make me popular, but it did save a lot of potential heartache for my client. Not surprisingly, the quality of the many garden and landscape apps available varies greatly and I am yet to find one that caters specifically to gardeners in the UAE. Because of the nature of the current apps market, the information included in many of the resources has an understandable North American bias, and many that claim to be encyclopaedic aren’t. However, there are several apps that stand out either as general reference tools or for their ingenuity. If you’ve ever wondered what that creepy crawler was doing to your tomato plants, check out Darren Gates’ Bugs and Insects to find out. It has a database of over 900 creepy crawlies and is thankfully loaded with photos (because, quite honestly, how useful would a written descriptions of bugs be?). Though it’s limited to North American trees, LeafsnapHD is a thing of utility and beauty that uses digital visual recognition software to help identify tree species from the photographs you take of their leaves. It’s also an incredibly detailed electronic field guide containing more than 2,500 high-definition images of leaves, flowers, fruit and bark. For those who really love their plants, it’s a kaleidoscopic, visually intoxicating treat whose effect can only be described as hypnotic. In terms of its sophistication and aesthetics, The Plant Doctor could not be more different. However, this is an app that is easy to use and will benefit anybody who struggles to keep their houseplants alive. The Plant Doctor takes you through 32 common symptoms to deduce the root cause of your problem and provide a solution. If your problem isn’t listed, the app collects user-supplied text and photos and sends these to a professional plant pathologist for diagnosis and further advice.